In a nice role reversal Harold questions Albert where he has been "wandering around London like Count Dracula in the middle of the night" Albert explains that he has spent the last two hours with Daphne Goodlace and that that he "has asked her to marry me", a classic response from Harold "I thought you said you wanted to make her happy". A nice nod to the 1963 episode The Stepmother follows "We have been through all this before" sets the tone with Harold expecting another "old bird". After some poignant father and son moments and with further consideration "I can see it now Corsets all over the place" Harold gives the wedding his blessing and a meeting is arranged for the next evening. Harold promises to be "Charm personified". 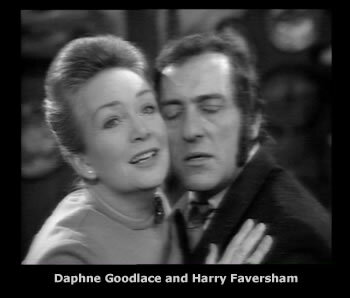 The meeting between Harold and Daphne is classic Steptoe as Daphne turns out to be only 42 and Harolds lover from 20 years earlier.In the moment they both realise that they have feelings for each other. Some fine acting from everyone here. The awkwardness continues with the old man explaining that Harold "Can't get used of having a new mum". Left on their own (and reunited) Harold & Daphne explain why their relationship 22 years earlier didn't continue whilst Harold was on National Service "I was the original virgin soldier" waiting for Daphne who having not heard from Harold has married and was then widowed. Harold realises that they still love each other "O Gawd what a mess, what we gonna do" adding that she can't marry Albert and that she should marry him. The awkward atmosphere continues when Albert returns with the engagement ring. Albert is full of joy which is short lived. Harold explains with "the hardest thing he has ever had to say" that "Daphne and I are lovers" classic Albert response "but shes only been here 10 minutes". Whilst the two men discuss what they should do , Daphne quietly leaves the house having left a note explainig that she doesn't want to split them up because they are already married. 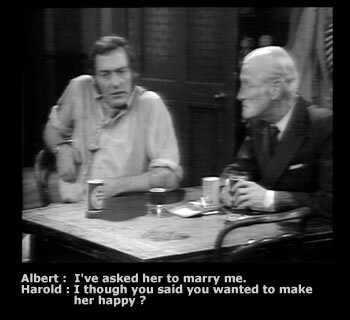 This point is completely lost on both of then and they leave to use the resturant table that Albert had already booked with Harold now adopting the role of wife "What a bloody ridiculous thing to say" as he staightens Alberts tie and hair... brilliant. Albert has fallen in love and wants to marry. Will Harold approve. ? Buy the DVD and meet the bride.